Former Open champion Mark Calcavecchia set a new PGA Tour record in the third round of the Canadian Open in Oakville with a run of nine consecutive birdies. The 49-year-old started at the 10th and took advantage of rain-softened greens and preferred lies, while all his birdie putts came from inside 15 feet. However, his 65 left him joint-17th at eight under, five off the lead. The previous record of eight birdies was held by a half dozen players and last achieved by Jerry Kelly in 2003. Calcavecchia's amazing run started on the par-three 12th hole - his third - and continued to the par-five 2nd. The streak ended on the par-four 3rd when his chip from over the green went five feet past. The American, who won the Open in 1989, saved par to remain 10 under, but dropped a stroke on the par-three 4th after hitting into a greenside bunker, and then bogeyed the 8th. "It is just fly it right to the stick," he said of his remarkable round. "You give the guys out here no wind and greens that are plugging then you are going to see a lot of low scores. "Records are made to be broken. Could somebody make 10 in a row? Sure, it wouldn't surprise me if some guy whips out 10 birdies in a row sometime this weekend, it really wouldn't. These guys are good." 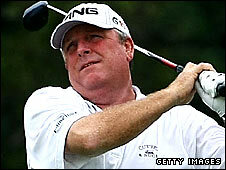 Calcavecchia has 13 tour victories, the last of which came in 2007 at the PODS Championship. The burly veteran had his 15-year-old son as his caddie and when asked for his thoughts Calcavecchia jnr said: "Pretty cool. It's exciting." "A man of many words over there," his father joked.